By now you know that my mom was the primary cook in our house. She made us dinner almost every night. Still, my dad does have a few signature dishes that he'd make occasionally, which I really loved as a kid. One was apple pan dowdy. Another was matzah brei. And the third -- the marvelous third -- was latkes. My father's latkes are the best. They're lacy and delicate, well-seasoned, and unshyly fried to a (sometimes deliciously burnt) crisp, just the way I like them. I've made them his way several times over the years. I've also tried my hand at my mom's equally good sweet potato latkes, and have -- as she sometimes does -- mixed some zucchini into my pancakes. All varieties are worth making, now aren't they? Hanukkah provides an annual excuse to blithely and guiltlessly fry things. Never one to squander such an opportunity, this year I decided to experiment in the fried-root-vegetable-pancake department. No potato latkes for us this time around; the wringing and sieving and squeezing what appears to be an endless stream of liquid from those tubers simply got the best of me. Instead, I turned to the book that now sits front and center on my new cookbook shelf: that'd be Plenty, the newish book from Tel Avivi/Brit Yotam Ottolenghi. It's like this book was written just for me: eggplant, pomegranates, tomatoes, feta, and yogurt are just about everywhere. And everything I've read about this book suggests that it's ideal when used as a starting point, a resource for improvisational cooking. That's just my speed. 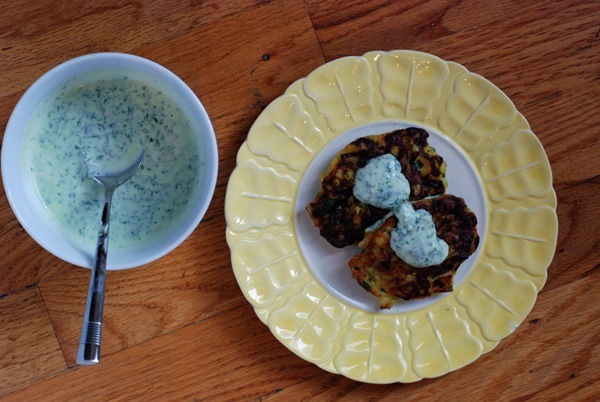 Page 34 of Plenty contains a recipe for leek fritters that I've been planning to make for weeks in honor of the holiday. Encouraged to riff, I made a slew of changes to Ottolenghi's template. Most notably -- and I know this departs from the Hanukkah zeitgeist of frying everything in oil -- I swapped half the olive oil out for butter. Sorry, I couldn't resist. I also found that a bit of water really helps the leeks soften more quickly, so I added that along with the butter and oil. Out of shallots, I used half an onion. It works; shallots would be wonderful, though. Also, I skipped the whipped egg white. Less fuss, and the pancakes were still plenty fluffy. You can thank me later. You know what's great about this latke batter? It requires no squeezing. Leeks don't leak. They just stay put, incorporating seamlessly into a batter scented with tumeric and cinnamon, coriander and cumin. I might add a tiny pinch of ground cloves next time, for a base note. Other than that, not much I'd change. The latkes are shockingly light, aromatic, and a really nice change from the usual potato variety. Improv cooking, again a success. Though that yogurt sauce? I actually made it according to the recipe. And after devouring half with a spoon tasting it, I wouldn't change a thing. Right, so about that whole "by the recipe" thing. I actually swapped in creme fraiche for the sour cream Ottolenghi calls for, and I used a lot less of it than of yogurt (recipe says half and half). I liked the tang of the creme fraiche, but I've come to the purely speculative conclusion that this sauce would be great with any mixture of yogurt, creme fraiche, and/or sour cream that you like or can make based on what's in your fridge. Go forth and improvise! When you do fry these up, use either a nonstick or cast iron pan. I test-fried a batch in a regular stainless steel pan, and with enough oil or butter they won't stick, but make your life easier and use something nonstick. In a large skillet, melt 4 tablespoons of butter and 2 tablespoons olive oil over medium heat. Add leeks and shallot or onion, toss to coat with butter/oil, then add water to pan. Cook about 10 minutes, stirring occasionally, until water has evaporated and leeks have softened. Remove from heat and add chile, parsley, spices, sugar and salt. Set aside to cool completely. While leeks cook, make the yogurt sauce: blitz everything in a food processor until fully combined into a uniform, light-green sauce. Melt remaining 4 tablespoons of butter. In a separate bowl, combine eggs, milk, melted butter, flour, and baking powder to form a loose batter. Add cooled vegetable mixture, and fold together just until combined. Set up a platter next to your stove, and line it with 1 layer of paper towels. Heat 2 tablespoons of olive oil in a large skillet over medium heat. Test oil heat by dropping a small bit of batter in; if it sizzles when it hits the oil, you're ready to fry. Use a standard ice cream scoop or 2 large spoons to scoop batter into the pan. My large skillet fit four latkes at once. Fry latkes for 2-3 minutes per side, until golden brown. Transfer to towel-lined platter when finished cooking. If doubling the recipe, you can store finished latkes in a warm oven (275 degrees F will do) while you make a second batch.